A large, silver supported steel bridge, of the kind common to railroads decades ago. It is approximately 550 feet long, and is situated in a grove of Cottonwood trees spanning the San Francisco River. This is a very old style bridge, and very few remain in the United States. This one is also in excellent condition. The bridge was built in 1926 as part of the first paved road leading north from Silver City. 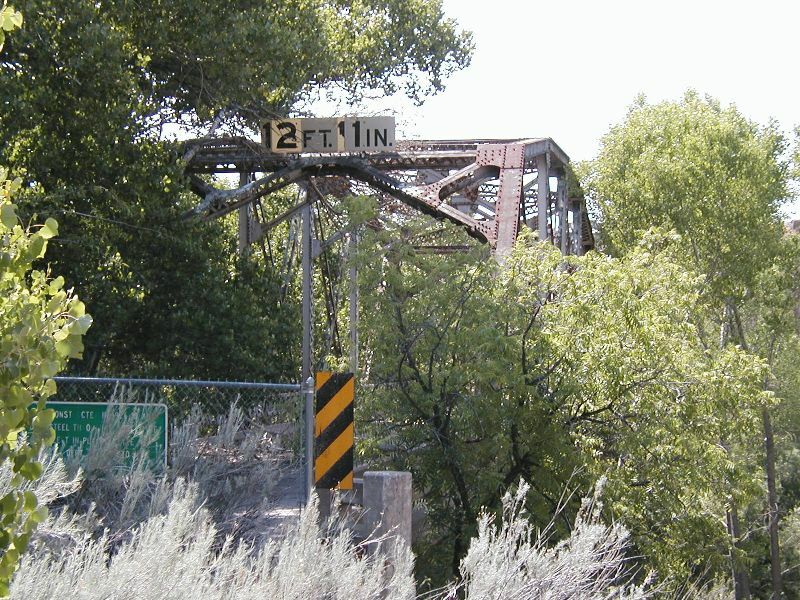 It is a through truss steel bridge, and is the last of its kind in New Mexico. It carried daily traffic until 1980, when the road was rerouted. In spite of its age, it looks as strong today as ever, and appears perfectly driveable. It is simply being allowed to sit by the state so that people can observe the old style construction. Left undisturbed, it might sit for another 150 years. This location's validation is current. It was last validated by Emperor Wang on 7/12/2006 6:03 PM. This page was generated for you in 93 milliseconds. Since June 23, 2002, a total of 574076661 pages have been generated.